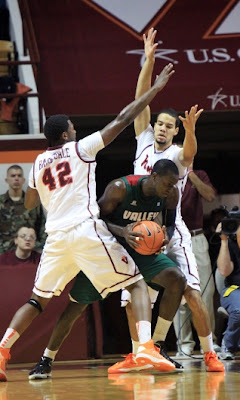 VIRGINIA TECH 70, MVSU 49 - The Hokies got their groove back after their first loss of the season with an easy win over Mississippi Valley State last night in Blacksburg. Erick Green scored 23 points to lead Virginia Tech. The Hokies (8-1), coming off a last-second loss at West Virginia on Saturday, took control with an 18-4 run that spanned both halves. They trailed only once, falling behind 22-20 after Mississippi Valley State's Matt Smith scored the second of back-to-back baskets with 6:28 left in the first half. But after Smith's basket, Virginia Tech ripped off 10 straight points, with Green scoring six of the 10. He hit 8 of 13 from the floor for the game and all six of his free-throw attempts. He has scored more than 20 points in all nine games this season. Mississippi Valley State (0-6), which has opened the season with six straight road games against teams from BCS leagues, was led by Davon Usher's 19 points. The Delta Devils only shot 25.7 percent (18 of 70).